Mix masa harina, lard, salt and baking powder in large bowl with wooden spoon until well blended. Gradually add just enough of the hot water to make a smooth stiff dough, stirring constantly. Assemble tamales, using about 2 Tbsp. of the masa mixture and 1 to 2 Tbsp. of your favorite filling for each tamale. Stand tamales in a steamer basket in large pot filled 1/4 full with water. (Make sure tamales are not touching the water.) Bring water to boil; cover. Steam 1 hour or until tamales pull away from the corn husks, adding more water to the pot when necessary. Cool slightly. Enjoy preparing this traditional recipe with your friends and family. When the tamales are ready to be enjoyed, keep an eye on portion size. 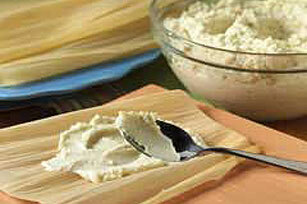 When making sweet tamales, substitute sugar for the salt. Tamales can be assembled, wrapped tightly in foil and stored in the refrigerator for up to 2 days, or in the freezer for up to 6 months. Steam as directed. Makes enough for 26 servings, 2 tamales each.